The Oswego, N.Y., native’s hard-nosed play and ability to make things happen earned him a spot on the 2006 U.S. Olympic Team. He was also a member of the 2005 U.S. National Team, finishing second in scoring. Cole is now in his sixth season with the Carolina Hurricanes. Checking is one of the most demanding skills in hockey, and also one of the most overlooked by players, coaches and fans. It is probably the least glamorous of all skills, but one of the most important when it comes to defensive team play. Checking is a skill designed to aid in the recovery and possession of the puck. It should not be used to intimidate or injure an opponent. 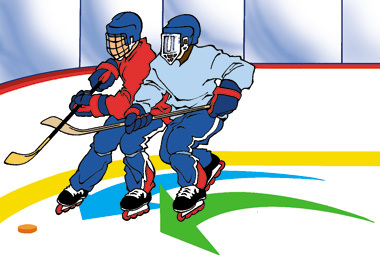 To carry out the proper checks along the boards, you must learn to force the puck carrier towards the boards. The key is to steer the puck carrier in the direction you want by angling him or her into the boards under a controlled speed. • Keep yourself stick-to-stick and body-to-body with the puck carrier. 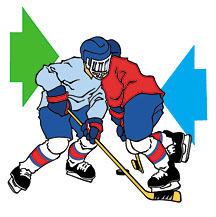 • Continue to skate when close to the puck carrier — don’t glide into the check. • Concentrate on the puck carrier, not the puck. • Aim to hit a point on the boards in front of the puck carrier. • Keep your body low and your legs spread for balance. • Concentrate on the chest of the attacker since it is the most difficult part of the body to shift quickly. • Keep your feet shoulder-width apart. • Bend your knees and keep the weight on the inside edges of the blades. • Use your legs to drive your shoulder into the opponent’s chest. Keep your head up and your stick down at all times. USA Hockey strongly discourages checking from behind, but if it should happen while you’re facing the boards, get your stick and gloves up to spread out the area of impact. Use your arms as shock absorbers. Submitted by sam dabrowski on Tue, 2009-09-15 19:56. Submitted by BRuin_Fan on Tue, 2009-06-16 12:12. This will be my first year of peewee and I'm going to a hockey camp in a couple days and I didn't really know how to check the right way but know I know.